Northwest Portland, Oregon real estate offers an eclectic mix of storied tradition. Revitalized neighborhoods and hip, cool shopping districts draw people from all around.Bordered by the Willamette River to the east and north, and Burnside Avenue to the south, Northwest Portland residents enjoy a unique urban setting conveniently located to shopping, restaurants, jobs, health care, and a vibrant art scene. No other section of Portland can claim a more diverse offering of shops and restaurants than Northwest Portland. The Nob Hill shopping district on NW 23rd Avenue offers a wide assortment of specialty shops to please everyone from the casual shopper to the ardent aficionado.There are a number of notable dining options available including Escape from New York Pizza, an inexpensive local favorite for ordering pizza by the slice. The revitalized Pearl District has undergone significant urban renewal and boasts a number of upscale restaurants and loft condominiums. 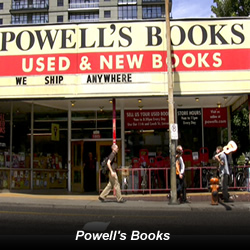 While visiting the Pearl District, make a stop at Powell’s Books -- the largest independent bookstore in the world -- featuring several floors of new, used, and rare books organized by topic and genre in various colored rooms. Northwest Portland offers the epitome of northwest living in Forest Park – the largest park of its kind throughout the United States!Forest Park includes over 5,100 wooded acres, complete with a 40-mile trail system used for hiking, biking, and horseback riding. The hillside was recognized during the Lewis and Clark expedition for its notable collection of Douglas fir, and remains a favorite escape for all Portland area residents. Other notable parks include Couch Park on 19th and Glisan, Wallace Park at 25th and Raleigh, and The Hillside Community Center, which features a community center with meeting rooms, an indoor basketball court, and a rock climbing wall. Northwest Portland, Oregon real estate is as diverse as the people who live here, from newly renovated warehouse-to-loft conversions in the Pearl District, to the Victorian homes and established apartment buildings peppering Nob Hill, to the stately view properties overlooking the city and river along the Northwest Portland hillside.Northwest Portland homes for sale offer great value and proximity to the very best of what Portland has to offer. The Portland School District administers Northwest Portland’s public schools, while several private schools provide additional options including the Emerson School, Childpeace Montessori School, Cathedral School, Congregation Beth Israel School, and the music-lovers favorite, the Bandworks School of Rock, which offers music camps and classes for kids of all ages. Additional programs are provided by the Linfield College School of Nursing, The Art Institute of Portland, Portland Community College, Willamette University, and Pacific Northwest College of Art to name but a few. Residents have convenient access to a variety of excellent health care services.Several hospitals are within easy reach including Kaiser Permanente, Legacy Good Samaritan and Legacy Emanuel Hospitals, Oregon Health and Sciences University, Doernbecher Children’s Hospital, and the Portland VA Medical Center. TriMet offers convenient bus and rail services for Northwest Portland residents, providing people an easy way to move about the city, and well beyond.